Welcome Back to Football Friday and the Game Day Recipe. This dip will definitely scare away any Vampire or any person who dares to come close to you! After one “bite” of this delicious dip, you’ll keep coming back for more. 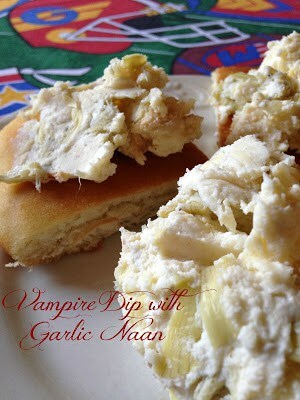 Vampire Dip with Garlic Naan is perfect to serve as an appetizer if you’re planning a Halloween Dinner. Unbelievably Garlicky! Unbelievably Delicious! 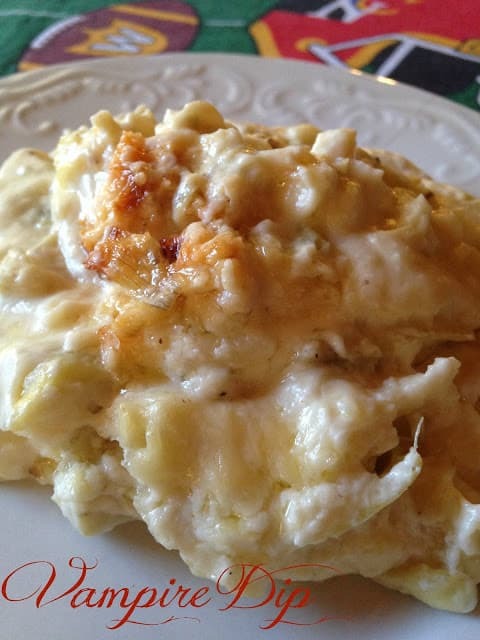 This recipe is a copy-cat recipe based on a recipe that is a favorite at a place called Slater’s 50/50 of Anaheim Hills. Slater’s is famous for burgers, bacon and more bacon. They even have bacon cocktails and bacon desserts. The menu does include vegetarian options as well. Slather’s is famous for their Vampire Dip, which is a warm cheesy dip with loads of garlic. Looking for another great “dip” recipe? Give this one a try for Dill Pickle Dip. Let’s Get Cooking! A delicious and garlicy dip and naan perfect for Halloween. 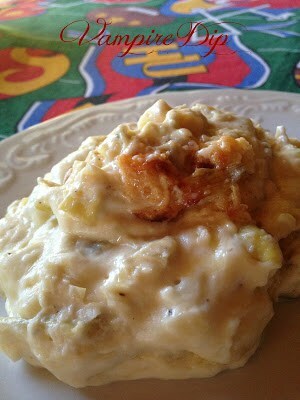 Mash all ingredients together in a 2 quart casserole dish. Bake at 350º for 45 minutes covered. Uncover, bake an additional 15 minutes. In a large bowl, dissolve yeast in warm water. Let stand 10 minutes. Stir in sugar, milk, egg, salt, and enough flour to make a soft dough. Knead 6 to 8 minutes on a lightly floured surface or until smooth. Place dough in a well oiled bowl, cover with a damp cloth and set aside to to rise. Let rise for about 1 hour in a warm place or until the dough has doubled in volume. Punch dough down and knead in garlic. Pinch off small handfuls of dough about the size of a golf ball. Roll into balls, and place on a tray. Cover with a towel, allow to rise until doubled in size, about 30 minutes. Roll one ball of dough out into a thin circle. Lightly oil grill. Place dough on grill, cook 2 to 3 minutes or until puffy and lightly browned. Brush uncooked side with butter, turn over. Brush cooked side with butter, cook until browned, another 2 to 4 minutes. Remove from grill, continue the process until all naan have been prepared.